Natural gas prices continued on their upward trend through the beginning of April. On 7 April, the Henry Hub Natural Gas price was USD 3.19 per one million British thermal units (MMBtu). The price was up 23.6% from the same day last month, but still was 13.3% lower on a year-to-date basis. The price has recovered from the record-low levels seen at the start of last year and was up 64.4% from the corresponding date in 2016. The EIA’s storage report late last week drove most of the hike in natural gas prices. Storage data revealed far lower storage injections than anticipated by analysts. The EIA also published data showing that natural gas consumption was on the rise through the end of January. At the same time, natural gas production was relatively flat and the number of natural gas rigs increased only marginally, remaining far below last year’s high. Expectations of stormy weather across vast swaths of the U.S. have supported the spot price. The Russian economy has responded exceptionally well in the last two years to the dual shocks of collapsing oil prices and the continuation of Western sanctions. GDP decreased just 0.2% in 2016, which followed an upwardly revised 2.8% contraction in 2015 (previously reported: -3.7%). Tighter fiscal and monetary policies and a flexible exchange rate ensured a much smaller GDP decline in 2015 and 2016 combined than in 2009, when the economy plummeted nearly 8%, despite higher oil prices back then. Further indications that a nascent economic recovery remains in place at the beginning of this year were supported by PMI data for March and a strong increase in exports in January, which resulted from a pickup in exports both of oil—due to higher prices—and of non-oil products, particularly machinery, reflecting stronger demand from other CIS countries. This year, the gradual economic recovery is expected to be supported by higher oil prices and the continuation of a disciplined policy approach, as Russian authorities seem determined to persist with prudent policymaking. Economists project that the economy will expand by 1.3% in 2017, which was left unchanged from last month’s forecast. For 2018, analysts see GDP growth accelerating to 1.7%. In the past weeks, the price of Brent Crude Oil, the global benchmark, has been dominated by a tug of war between OPEC seeking to staunch supply and the U.S. shale industry ramping up production, encouraged by the recovery in prices. The standoff has left the price in a tight range. On 7 April, Brent Crude Oil prices traded at USD 54.3 per barrel, which was 0.3% lower than on the same day in March. The benchmark price for global crude oil markets was down 1.7% on a year-to-date basis, but still was 45.2% higher than on the same day last year. Skepticism that OEPC cuts will rebalance the global oil markets is growing as inventory draws have been limited in Q1 2017. This has been the key reason for weakness in the past month. Consequently, Brent prices averaged USD 53.7 per barrel in Q1, virtually in line with our Consensus forecast, which had the price averaging USD 54.0 per barrel. That said, there are indications that the market rebalancing is well and truly underway. Tanker data for Q1 indicate that OPEC exports have fallen by more than 1.3 million barrels per day compared to the previous quarter and refinery activity accelerated in the same period. This, and the fact that the summer driving season in the U.S. is coming, is expected to boost demand and to drive prices higher. Nevertheless, the latest data from the EIA showed that U.S. inventories continued to grow at the beginning of April. The UAE’s economy has looked fairly perky in the first few months of this year, with the PMI remaining firmly in expansionary territory, likely as a result of higher oil prices. In a sign of the stable fiscal position, the government was able to raise spending in Q2 and Q3 2016 year-on-year according to recently released data, following a period of contraction. The UAE has navigated the sharp fall in oil prices observed towards the end of 2014 better than its neighbors, aided by a diversified economic base and high competitiveness. The latter has been given a boost this year with the coming into force of a new bankruptcy law, which modernizes restructuring and insolvency procedures and should prove to be a boon to SMEs. The economy should gain speed this year, with preparations for the Dubai 2020 World Expo giving domestic demand a shot in the arm. However, the oil sector will remain hampered by OPEC production cuts, which could extend beyond the original June deadline, while tighter monetary policy linked to monetary normalization in the U.S. will dampen economic activity. FocusEconomics panelists expect GDP to rise 2.5% in 2017 and 3.2% in 2018. Read our post on the economic outlook for top oil producers for more information. Gold prices rose to the highest level in five months in recent weeks as political developments sparked safe haven buying. On 7 April, gold closed the trading day at USD 1,266 per troy ounce, which was up 3.8% from the same day in March and was up 2.0% from the same day last year. Gold prices have risen strongly since the start of the year and April’s price was 9.3% higher on a year-to-date basis. Political uncertainty has intensified this year, driving the recent spike in gold prices. Prices jumped in April after the new United States government stepped up its involvement in Syria’s civil war, sparking fears of a clash between the U.S. and Russia. A lack of clear policy guidance from the world’s largest economy has kept investors on edge and fueled safe haven buying, and a meeting between Trump and Chinese President Xi Jinping added to market nerves. This comes despite solid data out of the United States, expectations that the Federal Reserve will continue to hike interest rates and soft demand from India. Data continues to suggest that weakness in South African economic activity persisted in the first quarter, following a GDP contraction in Q4. The economic outlook has also taken a turn for the worse after Fitch Ratings downgraded South Africa’s sovereign rating from investment grade to junk on 6 April, following a similar move by S&P Global Ratings on 3 April. Both downgrades are the direct result of a cabinet reshuffle carried out by President Jacob Zuma on 31 March, when he ousted his respected Finance Minister Pravin Gordhan and four other ministers, replacing them with loyalists. The move suggests a potential retreat from fiscal prudence, a rise in spending and increased opportunities for patronage. The new Finance Minister, Malusi Gigaba, insists that the government will adhere to the fiscal targets presented in the 2017 budget, but—unlike Gordhan—he lacks the authority to defy presidential instructions. GDP growth should pick up to 1.1% this year from 0.3% last year, supported by an improvement in the agricultural sector and higher prices for several of the country’s key export commodities. However, analysts cut growth forecasts by 0.1 percentage points from last month’s projection as heightened political risk and the credit rating downgrades will deter much-needed capital inflows, which will impact investment. Next year, economic growth is projected to reach 1.7%. Soybean prices nosedived in recent weeks as the unprecedented Brazilian harvest flooded the market. The commodity has also taken a hit from prospects that U.S. farmers will plant a record number of acres of soybeans this year. On 7 April, soybeans traded at USD 906 cents per bushel, which was down 8.2% from the same day in March. The price was 7.3% lower on a year-to-date basis but was up 3.0% from the same day in 2016. The latest fall has been attributed to a record-high Brazilian crop making its way to the market. Near perfect weather conditions have allowed Brazil to register record yields this year. Data from the U.S. Department of Agriculture also showed that U.S. farmers’ soybean-sowing intentions have risen to the highest reading on record, in response to prospects of sustained demand for this year and the next as China continues to import massive volumes of the legume. A steeper fall in prices has been prevented by fears of harvest delays in Argentina, as rain in the country threatens a repeat of the supply disruptions that were caused this time last year. Monthly data is suggesting that the Brazilian economy has turned a corner, after GDP contracted sharply in 2016. The manufacturing PMI recorded the best result in over two years in March and both business and consumer confidence rested at multi-year highs. In addition, the country logged a record USD 7.1 billion trade surplus in March, aided by strengthening commodity prices. However, dynamics are still weak, highlighted by a worsening in the labor market in February. On the political front, after a successful 2016, the Temer administration’s ambitious pension overhaul is facing significant opposition in congress. The government announced it will unveil a slimmed down version of the reform on 18 April, after surveys showed that the reform had very little congressional support ahead of general elections in 2018. Brazil has one of the world’s most generous pension systems and reform is vital to put public finances on a more sustainable path. The economy should begin to recover from the worst recession in modern history this year on the back of lower inflation, improved confidence and less-tight monetary policy. However, growth will be marginal overall and analysts see GDP expanding a meagre 0.5% in 2017, which is down 0.1 percentage points from last month’s forecast. The recovery is seen gaining speed in 2018 and GDP should increase 2.4%. Copper prices have seen little change over the last month, and remain substantially above the level seen a year ago. While supply constraints have eased, demand has remained robust, particularly from China. On 7 April, the spot price was USD 5,799 per metric ton, which was 0.8% higher than on the same day last month and was up 5.0% on a year-to-date basis. Moreover, the price was 24.3% higher than on the same day in 2016. As has been the case so far this year, the supply side played a key role in developments last month. At Chile’s Escondida mine, which accounts for around 5% of global copper output, the union finally reached an agreement on 23 March with BHP Billiton, the mine’s operator, after a 43-day standoff. Workers agreed to revert back to their old contract for a further 18 months, forgoing bonus pay and the salary increment they had demanded. Meanwhile, the situation at Indonesia’s Grasberg mine is also looking up, with the dispute over copper concentrate exports between Freeport-McMoRan, the mine’s operator, and the government nearer to a resolution. The government recently issued the company with a temporary mining license, and talks between the two sides are ongoing in order to find a more permanent solution. Despite supply coming back on stream, strong demand for the red metal has been propping up prices. Chile’s economy faltered in the final quarter of last year, with recently released data showing growth was driven lower by a decline in fixed investment and a tepid showing from the mining sector, capping off a year to forget for the Andean nation. The already-cloudy economic skies darkened in February, with the monthly economic activity indicator recording a sharp drop as strike action at the Escondida mine disrupted copper production. Although workers put a stop to the strike towards the end of March, choosing to revert back to their old contracts, the Central Bank estimates the lost output at the mine will chip 0.2 percentage points off GDP growth this year. This highlights the continuing dependence on commodities to fuel the economy, which remains hampered by downbeat consumer and business sentiment, with both indicators remaining entrenched in negative territory in March. 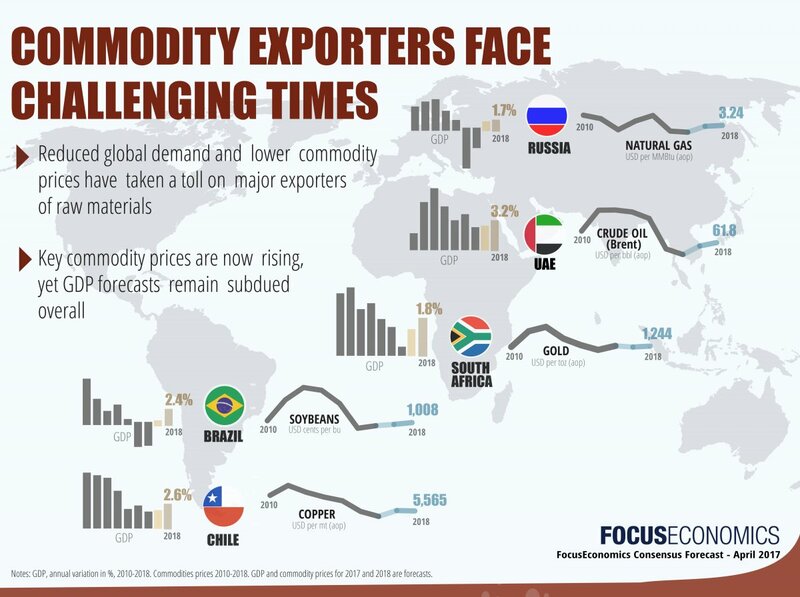 There is likely to be a mild uptick in growth this year thanks to higher copper prices and a stronger external environment, particularly in the rest of Latin America. Looser monetary policy should also support ailing investment, boosting domestic demand. However, continuing subdued consumer and business confidence mean growth will remain modest. FocusEconomics Consensus Forecast panelists see Chile’s economy expanding 1.8% this year, down 0.1 percentage points from last month’s forecast. The panel predicts growth of 2.6% for 2018. Was the commodity you were looking for not in this post? What about the country? You can find economic forecasts and analysis on 127 countries and 33 commodities on our website, so make sure to keep coming back to the website for economic information. 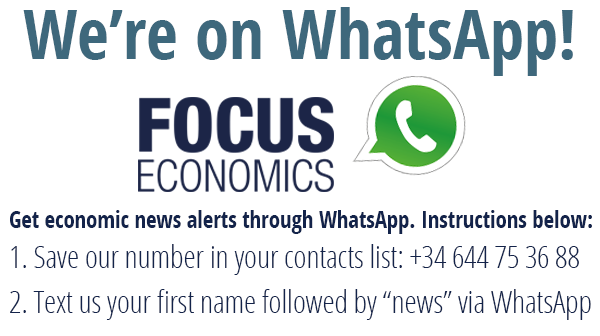 You can also click on the button below to get a free sample of the FocusEconomics Consensus Forecast.